Howard Liptzin at luna-park multimedia which is PR for AppsFuel contacted us to say that Countdown2MWC readers might be interested in the news that they’re running a competition to win a free entrance pass to the Mobile World Congress 2013 being held in Barcelona again this year. The contest ends on February 5th  and the company is giving away a total of five such passes. That’s worth €699 in value. All contestants have to do is to enter a simple contest here using their email address or Facebook Connect. In order to increase your chances of winning, you can earn points by promoting the contest on Twitter, Facebook or other social networks. The more people you tell, the more points that you earn. The more points that you earn, the higher your chances of winning. 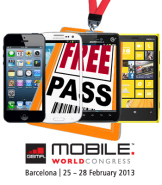 You don’t even have to answer a simple question such as who actually organizes MWC? The GSMA, of course. Anyway, all you need to know is your name and your email address. AppsFuel says it will contact all the winners directly using whatever account that they used to signup to the contest. Any questions can be sent to this email address – team@appsfuel.com. In case you didn’t already know, the company claims to be the Number One markeplace for HTML5 apps. And HTML5 is the easiest way to develop apps for the mobile web. Um. Is this just a clever trick to boost your chances of winning, we wonder?